Curious, I got closer to inspect her treasure. What could she have found, an injured butterfly, maybe a ladybug? I just stuffed an envelope for our social worker. This was almost the last bit of paperwork we needed for our homestudy. We are waiting on physicals for the kids (happens next week and I'm dreading it). As I'm writing I realize that it doesn't sound so hot, but I'm excited. This is the light at the end of the tunnel! I was so busy sightseeing in the tunnel I didn't notice that we were nearing the end. Most of the paperwork for our dossier is the original of what I just packed off in the mail for our social worker. So my beautiful stack is growing. I looked at the handy, dandy checklist and jumped for joy. Skipping into the living room with glee I sang out to Seth and Everett, "Look at this envelope, its full and we are alllllllll-most done!" Seth stopped his game of go-fish to express his disbelief. I had to actually show him the ragged checklist before he would believe me. He's been out of town and hasn't seen me in action. He's responsible for one document (the aforementioned employment letter), and I guess didn't notice that I was a little bee, gathering all we needed to get this done. So I'm twirling myself to the mailbox right now! After our visit with the social worker, I realized that neither Seth nor I have sat down with our kids and explained what is going to happen in the next year. After dinner that evening I started explaining that we would be getting two children, maybe a baby and a toddler. A sister and a brother, or maybe not, the whole time trying to make it vague (so no one is upset later) and understandable. This task was proving to be more difficult than I thought. So I went into the story of hwo we got Ella, "And do you remember how Mommy and Daddy went and got Ella from Ukraine? And that we didn't know how old your sister would be or what she would look like?" This lead to a discussion of how Ethiopia is different than Ukraine and they would send us pictures of our sister/brother before we go and get them. I thought it was all going well, paying close attention to the younger two. At this point Everett, in his ever-manipulative, convincing, big brother voice hollers, "BUT WAIT! This isn't fair. You and Daddy got to pick Ella out so I think that we should get to pick out this sister!" Wow, guess we have to go back over that one again. Is he not satisfied with OUR pick? Because I've gotten fond of the sister that WE picked out, and there is definitely NOT a return policy! 1. Apply to agency. Get stacks of paperwork requirements. 2. Start collecting various paperwork for Ethiopia (called your dossier, say dah-see-ay). Certified birth certificates, marriage license, employment letters, proof of insurance, etc. Everything needs to be official and notarized. 3. 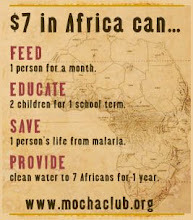 Apply to INS (aka bcis) for approval to adopt an international orphan. 4. Begin homestudy. Our social worker will also require much paperwork, most of it the same as what is required in our dossier. The social worker's job is to make sure that we are decent parents and have a safe home. This requires (by our agency) four visits with her. Two of them must be in our home (so she can check it out) and with our children. 5. Get fingerprinted A LOT. State has to clear us, the FBI clears us, and INS...well, I don't know why they are fingerprinting us, I guess to clear us there too. 6. Social worker finishes our homestudy. We get approved by the state to adopt. She sends a copy to INS. 7. Hopefully, collect all of remaining paperwork required for our dossier. Wait on our INS approval (I-171). 8. We are required by our state to have county seals, verifying that the notary is really a notary in that county. So we will take our notarized forms to the county seat and get them done. Doing this now will give us time to work on any mess ups. 9. I-171H arrives, make a copy, notarize it, take it to the county seat. Take the ENTIRE dossier to the state capital to be state certified. There they get a pretty seal. Then we make 3 copies of everything. 10. Mail the paperwork to DC to get authenticated by the US government. 11. Paperwork is shipped to Ethiopia for translation. Everything is processed at the Ministry of Women and Children's Affairs. 12. We wait. And wait some more. One day 4-6 months (who knows?) later we get a referral (pictures and information) for our children. 13. Make plans to travel 6-8 weeks after we accept the referral. Right now we are inbetween 5 and 6. Still quite a way to go, but you can never tell how these things will happen. Today we had our last in-home visit with our social worker. Then we took a family field trip to our county jail. We had to have a form stating that we don't actually BELONG in jail, and in order to get this, you have to go there. I guess it's a precautionary way that the sheriff, if you belong there, can grab you right then. When we got to the door, Eli backpedaled some (I was a little intimidated too) and said, "I'm not going in there." But I pulled him in and we walked past some bars, screens for viewing incarcerated loved ones, and into the records hall. The woman in there, God bless her, was so kind! She gave all my kids treats then went to the trouble of getting our forms notarized in triplicate without making us return for an appointment (which normally is required). So we got to check that little box off, but the rest of the afternoon didn't go as well. The employment letter has a notarization on it that expires next week. Good for our homestudy, bad for our dossier. It took us approximately 2 hours downtown to get the employment letter notarized. I'm hoping next time there isn't a soda shortage in the office that causes the admin guy to go on a FOUR HOUR soda run without leaving any clue to his whereabouts. I guess it wouldn't be much of a story if I said, "Seth got his employment letter today." AND wouldn't be much of a story for my kids if they didn't get frightened out of their wits and sit like little soldiers in the depths of the county jail for 30 minutes. I think I'll remember this the next time they misbehave at the doctor's office, "Do we need to go back to jail so you can remember how to behave yourselves?." This is something, so far, I have waited to comment on. Seth and I have the nasty habit of putting off big decisions. We talk, chat, pray some, and then just wait. I don't know what we are waiting for, perhaps to get the right decision in the mail? Or maybe a phone call? But, nonetheless, we wait and then discuss our options again and again. We have done this with our child request for this adoption. Timidly Seth mentioned that maybe we should adopt two kids. "Yipes," I thought, "Two kids?!" Where is the guy who was fine without any more kids? But the idea had some merit. So we talked about it...for a few months. We waited until our social worker asked us last week what we wanted in our homestudy. We didn't have an answer for her. We talked about what we'd like to do, which took about 5 minutes to explain. Our oldest is only 6, youngest is 4, we have two boys and a girl. We'd like one girl, but understand that girls are more requested, so we would like to adopt a boy, but then Ella would be the only girl in a family with four boys...you see where I'm going? "We are requesting two healthy children and are open to either siblings or a non-related pair. We would like to request an infant boy between the ages of birth and 12 months and a girl between the ages of birth and 3 years, understanding that if siblings are unavailable that there needs to be a 9-month age gap between the pair. If twins of either gender are available at this time, we are also open to adopting twins." Yep, she said twins. Now wouldn't that be fun? By 8:00 am-Seth out the door to a doctor's appointment. Two documents in hand to be filled out, one for notarization. A list of possible immunizations in hand also. No directions for doctor's office. By 9:30 am-All three children dressed, fed, cleaned. Apryl dressed, fed, cleaned. House tidied. Begin meager amount of homeschooling with children. Sing some songs, read Bible, pray. Everett practices his Chimpanzee report for a trip to the zoo this afternoon. Backpacks packed with lunches for afternoons at friend's houses. Leave the house. At 10-Drop Everett off with friends (who will take him with them to homeschool trip to the zoo). At 10:30 Drop Ella and Eli off with other friend. *Now the schedule falls apart* Seth is still at the doctor's office. We miscommunicate and end up falling behind in our race. At 11 (30 minutes late) Leave for BCIS fingerprinting. Drive for 2 hours in icy conditions, praying most of the time. Seth studies for Greek and History tests he will take tonight. At 1-Arrive at our destination with time to spare. Run up steep, icy hill just in time for appointment. At 1:05-Fingerprints done. Meet sister (she works in the Federal Building) for quick trip to cafeteria for lunch to go. At 1:25-Leave for home, 2 hour drive in slushy conditions. At 3:30-pick up children from assorted houses and race home. At 4:00-Arrive home, brew pot of coffee. Smooth clothes and welcome social worker into home for first in-home visit for homestudy. At 5:30-Social Worker leaves, planning to see us next week. Apryl realizes that she doesn't want to cook dinner. At 5:40-Apryl runs to the van, screams down the road and gets a "Hot-n-Ready" for dinner. At 5:55-Seth hugs all goodbye, smiles at his pizza and leaves for his tests at school. Apryl smiles at children, and pizza and finally takes a deep breath. So...at the end of this day-we haven't really got anything to show for it, but a few checkmarks in the little boxes on the long list of things to do. I am truly convinced after all of it that we wouldn't want to be on the Amazing Race. I couldn't do this for a million bucks, but I'll try to for a child. We have recently made some new friends. They live just across the river from us and are adopting two children from Ethiopia. We went to their house last night for dinner. It was such an encouragement to spend time with their family. They are Christians, and have two biological daughters who were willing to sacrifice their evening by playing with our three little ones. They are farther along in their adoption than us (their dossier will arrive in Ethiopia this week). When you are expecting a biological child, you are drawn to others who are also expecting. 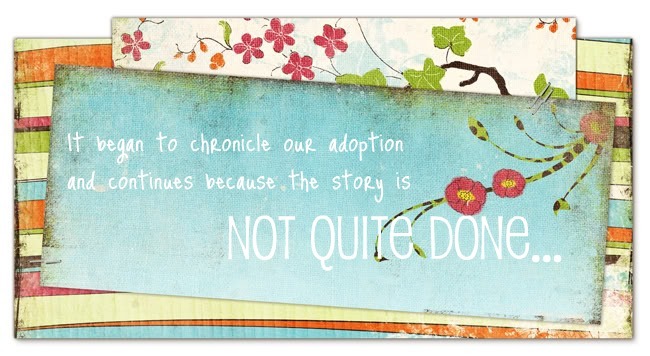 Expecting a child through adoption is no different, but you don't meet too many people in the same situation! Not to say I don't appreciate all of my friends, but it is really relaxing to be able to talk freely about something so momentous, without feeling like I'm boring the knickers off my company. Since they are ahead of us, we get to watch their adoption unfold firsthand anticipating that we will be in their shoes just a few months from now. We are very thankful that God has brought us together during this time. I'm also thankful that they have a high tolerance for obnoxious behavior and poor manners. Well, maybe they don't and we won't see them again. In all fairness, we do talk about and *try* to model polite behaviors at the dinner table. Elijah has ALWAYS burped like his dear Auntie (able to burp while reciting the alphabet), and we discussed his, ahem, knack habit talent before dinner recommending that he refrain or at least keep his mouth shut. Evidently he forgot, he is only four. And then there was the matter of using the community tongs as a personal eating utensil. Everett was surprised that he dared to have any rude behavior and couldn't believe that public tongs are NOT for placing food directly into your mouth. Guess we didn't cover that in Manners 101. Maybe we live in a barn and I just haven't looked around. We will try harder next time, really! Our Ukrainian Princess is 5 today! We are ble ssed to have two pictures of Ella as an infant. 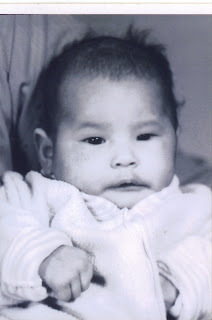 When we were in court, I saw that the orphanage director had these photos in her file on Ella. When I asked about them, she kindly gave them to me. What a treasure! We can only guess at her age in the pictures, the second one was the photo that we were shown when we decided to adopt her. She was two and a half at the time, obviously it had been years since the picture was taken. What an adorable baby, I feel my heart break every time I look at the pictures because we missed so much. This marks the day that her time with us equals her time in the orphanage. We are going into this adoption with experience that we just did not have when we brought Ella home. It did not matter that we read books, spent time with adoptive families, or scoured journals of Ukrainian adoptions. Each child is unique, and each one will come home with a different experience. What we expected was far worse than what we dealt with, but we also thought (albeit very naively) that we would not always be dealing with "issues". Just recently Seth and I came to the conclusion that Ella will probably always need more and be struggling to overcome those first two years of her life. It was a sad thing to think about, and I have to often stop myself from going into the "If only..." She is a remarkable little girl and we are so blessed to have her in our family. 1. I've lost count of how many days it has been since I have seen the sun. 2. Yesterday my four year old locked himself in the bathroom. My oldest thought it was so funny that we should be videotaping, so he snapped this photo. I spent half an hour in this pose before finally disassembing the knob and getting the door open. This is NOT the first time this child has done this (just the first time in this house). 3. We have a cat. We love our cat. Our cat had an upset stomach recently. Need I say more? 4. My daughter woke up at 2 am and peed in her bed. This is highly unusual and obviously I forgot to make her potty before bed. 5. My calender has at least 4 appointments or obligations on it everyday for the last three weeks of March. 6. My son decided he hates subtraction with a passion. His distaste is strong enough that he's made me question whether anyone ever needs to learn how to subtract. Not good. 7. My loving, caring, busy, in-laws didn't schedule their time share week early enough and got stuck with the first week of March. I guess we must seem frazzled, because they thought a week at the beach would do us good. God love 'em! We had freezing rain yesterday, and right now snowflakes the size of quarters are pouring down. I don't care, because I'm loading my summer things, my kids, grabbing the hubby, and heading south!